Franklin D. Roosevelt (CVB-42) was launched 29 April 1945 by New York Naval Shipyard as Coral Sea (CVB-42) ; sponsored by Mrs. John H. Towers, wife of the Deputy Commander in Chief, Pacific Fleet; renamed Franklin D. Roosevelt 8 May 1945 following the death of the President; and commissioned 27 October 1945 Captain A. Soucek in command. She was reclassified CVA-42 on 1 October 1952. During her shakedown cruise, Franklin D. Roosevelt called at Rio de Janeiro 1 to l1 February 1946 to represent the United States at the inauguration of the Brazilian president, Eurico G. Dutra, who came aboard for a short cruise. Fleet maneuvers and other training operations in the Caribbean preceded her first deployment to the Mediterranean, from 8 August to 4 October during which she was a part of a U. S. Navy force which visited Athens to bolster the government of Greece during its successful fight against the Communist. She received thousands of visitors during her calls to many Mediterranean ports, giving Europeans an opportunity to view this impressive addition to America's seapower for peace. On 21 July 1946, Lt. Cmdr. James Davidson, flying the McDonnell XFD-1 Phantom, made a series of successful landings and take-offs aboard Franklin D. Roosevelt in the first U. S. test of the adaptability of jet aircraft to shipboard operations. In November, Lt. Col. Marion E. Carl, USMC, flying a jet propelled P-80A made two catapult launches, four free take-offs, and five arrested landings aboard Franklin D. Roosevelt as part of continuing tests into the carrier suitability of the aircraft. Franklin D. Roosevelt operated off the east coast until July 1947 when she entered Norfolk Naval Ship Yard for a prolonged overhaul, during which she received improvements to her equipment and facilities. On 13 September 1948, the carrier sailed from Norfolk for a second tour of duty with the Mediterranean forces, from which she returned 23 January 1949. In a demonstration of carrier long-range attack capabilities, a P2V-3C Neptune, with Cmdr. Thomas Robinson in command, took off from Franklin D. Roosevelt off Jacksonville, Fla., and flew over Charleston, S.C., the Bahamas, the Panama Canal, up the coast of Central America and over Mexico to land the next day at San Francisco Municipal Airport. The flight, which covered 5,060 miles in 25 hours 59 minutes, was the longest ever made from the deck of a carrier. During the next few years, Franklin D. Roosevelt took part in intensive operations off the Virginia Capes, along the east coast, and in the Caribbean, and made four tours of duty in the Mediterranean. Assigned to extensive conversion at Puget Sound Naval Ship Yard, the carrier sailed from Norfolk 7 January 1954. Too large to pass through the Panama Canal, she rounded Cape Horn, and arrived at the shipyard 5 March. She was decommissioned there 23 April 1954. In February 1957, the recommissioned Franklin D. Roosevelt sailed to the Gulf of Maine for cold weather tests of catapults, aircraft, and other carrier equipment, including the Regulus guided missile. In July, she sailed for the first of three post-conversion cruises to the Mediterranean completed through 1960. Her assignments in the Mediterranean added NATO exercises to her normal schedule of major fleet operations, and found her each year entertaining a distinguished list of guests. Franklin D. Roosevelt supported the transport USS Kliensmith (APD 134) in the evacuation of 56 U. S. citizens and three foreign nationals from Nicara, Cuba, 24 October 1958, as the Cuban revolution came to a climax. On 6 March 1965, a Sikorsky SH-3A Sea King helicopter, piloted by Cmdr. James R. Williford, took off from USS Hornet (CVS 12) berthed at North Island Naval Air Station, San Diego, and landed 15 hours and 51 minutes later on the deck of Franklin D. Roosevelt at sea off Mayport, Fla. The flight surpassed the existing distance for helicopters by more than 700 miles. 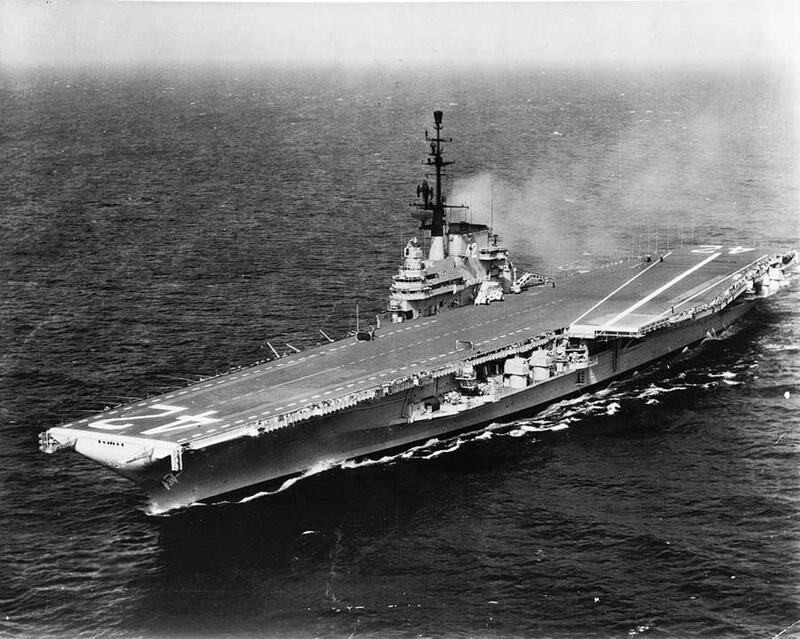 A new, major development in carrier fire prevention occurred on 26 May 1969 when Franklin D. Roosevelt put to sea from the Norfolk Naval Shipyard, Portsmouth, Va., after an 11-month overhaul which included installation of a deck edge spray system using the new seawater compatible fire-fighting chemical, Light Water. Continuing to serve, Franklin D. Roosevelt, along with USS Independence (CV 62) and USS Guadalcanal (LPH 7) stood by for possible evacuation contingencies during the Yom Kippur War between Israeli and Arab forces during October 1973. Another first was racked up by Franklin D. Roosevelt when, on 4 October 1976, the first overseas operational commitment on a carrier for the AV-8A Harrier began when VMA-231 embarked aboard for a Sixth Fleet deployment. On 13 January 1977, two other Harriers made bow-on approaches and landing aboard the carrier, marking the first time a fixed wing aircraft had made a bow-on, downwind landing aboard a carrier at sea. Franklin D. Roosevelt was decommissioned 30 September 1977, and stricken from the Navy List the following day. She was sold by the Defense Reutilization and Marketing Service (DRMS) for scrapping on 1 April 1978.